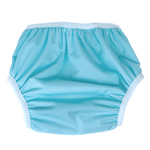 Training Pants have layers of absorbent cotton flannel built right in so that a child can feel wetness. These are build as an all-in-one, no need to wear anything else. Pocket Trainers are great for children who are too old for diapers, yet need some protection during naptime or overnight. These trainers have a fleece lining that keeps the skin dry. They require something absorbent inside the pocket. We carry two options - Pull-on trainers with No Snaps for a big kid look, or Trainers with Snaps on one side to facilitate stuffing them or taking them off. Each of the products we carry are made of high-quality materials in North America. 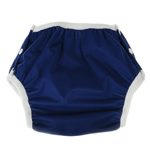 These are nothing like the plastic-outer, polyester inner training pants that you will find at large chain retailers.